The Gran Telescopio Canarias (GTC) has an altitude-azimuth mount and an optical layout of the Ritchey-Chrétien type with Nasmyth, Cassegrain and Folded Cassegrain foci. Its useful wavelength range extends from 365nm to 25 µm. The telescope consists of three mirrors which will be described in some detail in the following sections. Furthermore, user relevant information is given about the dome and the restrictions in elevation due to the dome shutter as well as tracking and guiding performance. The primary mirror of GTC consists of 36 hexagonal segments of Zerodur coated with aluminium. Each segment measures 1.9m from vertex to vertex and has a side length of 0.9m and a weight of 470 kg. They cover a total surface of 75.7 square metres and have gaps of 3mm between them; the surface of M1 is equivalent to a circular mirror with a diameter of 10.4 m. The effective light collecting surface area is 73.0 m. Due to the curvature of M1 the segments are not all identical but come in 6 types, corresponding to their six different distances to the center. Each segment, regardless of type, is supported by 3 position actuators which enable movements in piston, tip and tilt, as well as 6 moment actuators which allow a slight deformation of the segment. The relative positions of segments with respect to each other are measured with edge sensors. These are capacitive sensors that are mounted in pairs on the sides of adjacent segments. 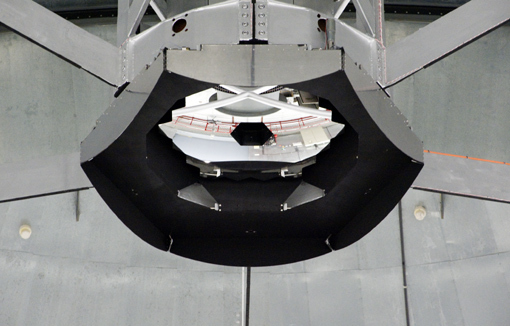 In order for M1 to act as one mirror instead of 36 individual telescopes it is necessary to align the segments in a specific way so as to form a near-perfect common focus. This process comprises two steps: stacking and phasing. For stacking, initially the image of a star is taken with the M1 segments in some random configuration. The positions of the 36 individual images are compared with their nominal position, and from the difference an array with piston, tip and tilt for each segment is calculated. In a second step, a fine tuning of the stacking including the alignment with the secondary mirror (M2) is performed with images from a wave front sensor. The alignment array is loaded at the beginning of each night to align M1 and M2. The stacking is quite stable so that the rough stacking procedure is necessary only after a major intervention such as a change of segments for cleaning and re-coating. The fine stacking is needed to maintain the best possible image quality, and is currently performed typically once or twice a week. 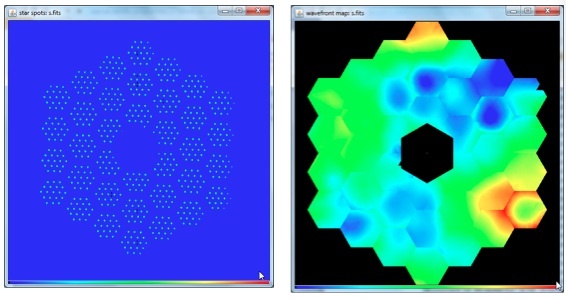 Left: example image of a wavefront test. Right: example wavefront solution. Once M1 is stacked, the next step is phasing which ensures that light from different segments is coherent. The process of phasing is carried out in two steps. First the image of the pupil is aligned with the lenslet array of the wavefront sensor to ensure that the two apertures of a double slit coincide with adjacent segments. The second step is the actual phasing, in which the segments are moved in piston. The interference pattern produced by adjacent segments allows to determine the piston positions where the light from both segments is coherent. In this way, the piston positions are calculated for all the segments to be in phase. Tip and tilt are not relevant for the phasing as these are determined during the stacking. Also the phasing stability is quite good, which means that normally twice per month the process has to be carried out. Apart from the 3 position actuators controlling movements in piston, tip and tilt, each segment has 6 moment actuators which allow a certain deformation of the segment. This function allows to compensate for deformations due to gravity and for imperfections of the polishing. It is relevant for the future implementation of adaptive optics, but not for stacking and phasing. The maximum deformation of a segment is such that the difference between centre and edge reaches about 1 µm. The secondary mirror is a lightweight convex hyperbolid of beryllium with aluminium coating. M2 defines the telescope pupil, and in order to minimize effects of thermal radiation its outer perimeter and central hole reflect the shape of M1. Its area is equivalent to a circular mirror with a diameter of 1.06 m. For alignment with M1, M2 has 5 degrees of freedom: movement in x and y (decentring) and focus (along the optical axis) as well as tip- tilt rotations. For chopping, the maximum frequency is 14 movements per second. The secondary mirror unit possesses a configurable baffle system that allows best possible performance when observing at optical wavelengths, as well of reduced thermal emission when observing in the mid-IR wavelength range. The effective focal length of the telescope is 170 meters. The secondary mirror with baffle. The tertiary mirror is a at elliptical shaped mirror with dimensions of 1521 cm x 1073 cm. M3 is mounted in a tower of 7m in altitude and 1.8m in diameter and can be inserted in the beam to direct the light to either of the Nasmyth foci or parked so that the beam reaches the Cassegrain focus. The accuracy of pointing is about 1 to 2 arcsec. Blind offsetting of the telescope can be done with reasonable accuracy. Over small distances (up to 15 arcsec) with the guider locked, an offset accuracy of 0.2 arcsec is common. For large offsets of 5 arcmin errors may increase to 0.5 arcsec. Tracking in open loop (without guiding) has an accuracy of about 1.5 arcsec per hour. GTC can track object with large proper motions while guiding. The two Nasmyth focal stations have identical devices for acquisition, guiding and wavefront sensing. The device consists of two probe arms, each of which contains two cameras. The fast guiding camera (FGC) and the segment tilt sensor (STS) in the second arm are currently not used. For slow guiding we use the acquisition and slow guiding (ASG) camera, the same arm contains the segment figure sensor (SFS). ASG has two filter wheels, one with colour filters B, V, G, R, I and one with neutral density filters. The filters are employed during guiding such that the guiding wavelength is adjusted to the wavelength of the scientific observation and to avoid saturation by bright guide stars. SFS has two lenslet arrays with a different number of lenslets, they are used for the alignment of the optical system during stacking and phasing. Guiding is in place in order to correct for pointing and tracking errors, with a precision of about 0.1 arcsec rms. This is especially important for spectroscopy and long exposures, however it is possible to observe without guiding if exposures are not longer than about 60 s. In the future, a fast guiding mode will be implemented which uses tip-tilt movements of M2. The dome has a height of 24m and an outside diameter of 35m. The shutter has a width of 13 m; the lower shutter with a weight of 16 tons is powered by 2 motors while the upper shutter with a weight of 41 tons is powered by 4 motors. For reasons of safety of the equipment it is currently not possible to open the dome to elevations higher than 72 degrees, the lower limit is 25 degrees. More information about the dome shutter can be found here. The dome remains cold day and night, so as to minimize risks of the creations of air turbulence that might affect the image quality. Moreover, all electronics in and around the telescope are actively cooled to minimize the heat load in the telescope environment.